Proper identification of grasshoppers, katydids and crickets often starts with some grasshopper pictures, etc. al. Here’s a run down of basic information, shape, colors and sizes for all interested visitors. Beginning with the basics, the Order Orthoptera consists of Grasshoppers, Crickets and Katydids. 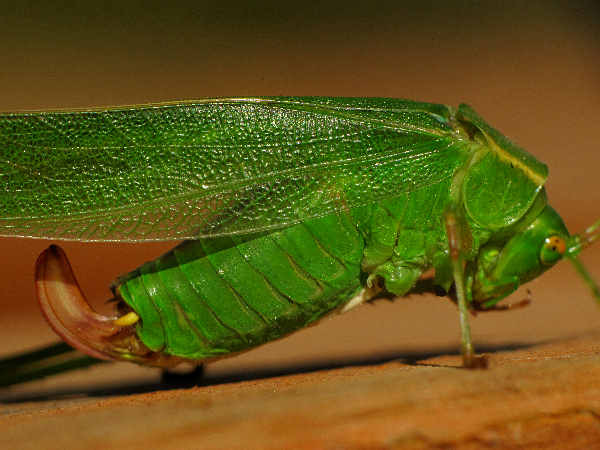 Formally, grasshoppers divide into families of the Suborder Caelifera and the crickets and katydids divided into families of the Suborder Ensifera. 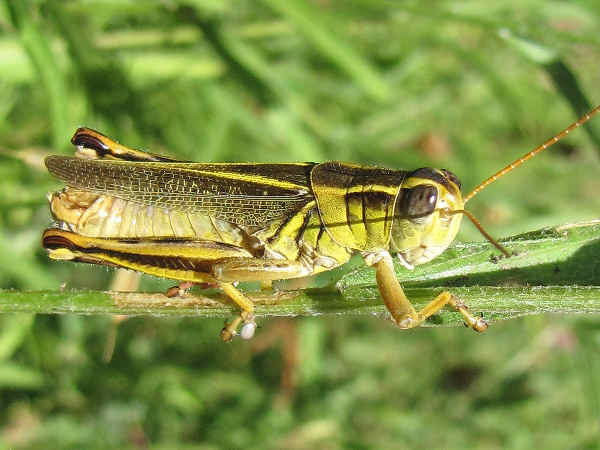 Many of the literally hundreds of different Orthoptera species are considered agricultural pests, making Orthoptera research a popular field in entomology. The picture at the top of the page shows one of many pest species found both in and away from the garden. It’s a Two-striped Grasshopper (Melanoplus bivittatus). They inhabits grasslands and sites of herbaceous vegetation throughout most of the United States, and they can be identified by the stripes starting on the head and ending in a “V” point at the bottom of abdomen. 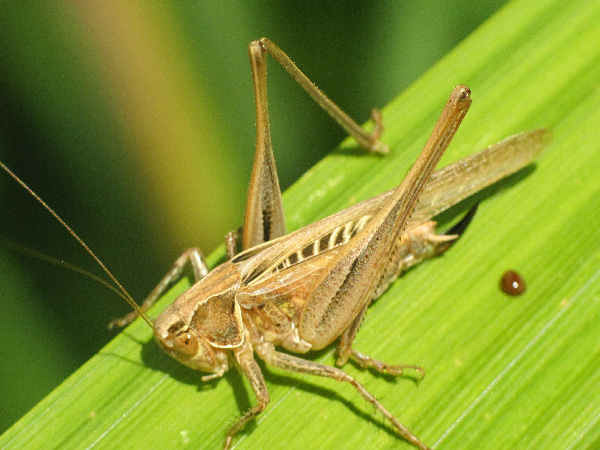 Gardeners also dread the coming of grasshopper season because of the grasshopper’s inclination to snack on most everything the gardener plants. Check out the video to see how a grasshopper can devour a flower. As a means of grasshopper control, experts suggest tilling the garden soil during the fall, deep enough to expose the eggs pods to the elements. They can not withstand the cold of winter. Grasshopper identification is no easy task. 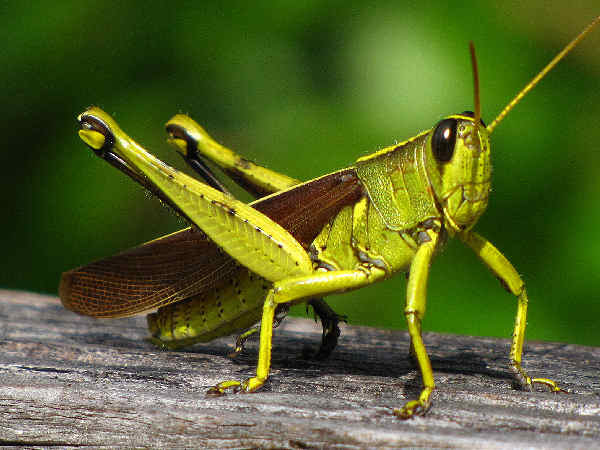 There are about 660 grasshopper species in the United States and about 11,000 species around the world. 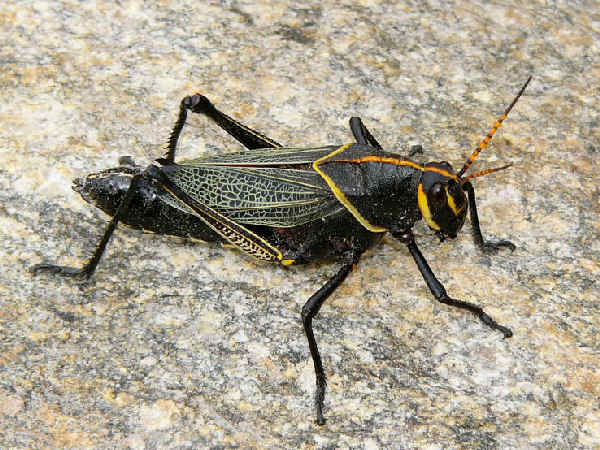 This introductory guide provides information on some of the types of grasshoppers, crickets and katydids that easily catch the camera’s eye. When it comes to grasshopper identification, most people think short antenna and brown or green body. 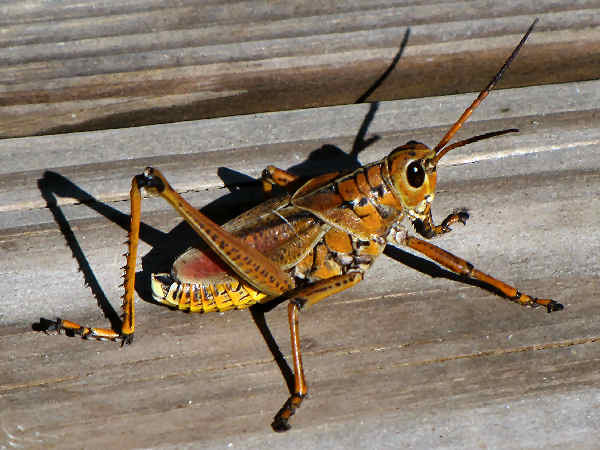 While partially correct, many grasshopper species such as the Lubbers (Family Romaleidae), have large, colorful bodies. The Eastern Lubber (Romalea microptera), a problematic Southeast species, often causes considerable agriculture damage. They grow to a fairly large size, with adults typically displaying either a colorful body, as shown in the picture. The Horse Lubber (Taeniopoda eques), a colorful inhabitant of the desert Southwest, sometimes move in large numbers looking for desert grasslands to feed upon. Grasshoppers in the genus Schistocerca, commonly called bird grasshoppers, are also known around the world as the swarming locusts. One Schistocerca species, the Desert Locust (Schistocerca gregaria), is responsible for many historical and contemporary agriculture disasters across Africa, the Middle-East and Asia, created when they form billion member swarms. Recent research suggests that Schistocerca species found in the United States descended from desert locusts that crossed the Atlantic Ocean some three to five million years ago. North America hosts ten of what come to be known as the swarming locusts. With the exception of the wide-ranging Spotted Bird Grasshopper, all inhabit a more limited geographical range. Generally, though not always, bird grasshoppers can be identified by the presence of a dorsal stripe. The Obscure Bird Grasshopper (Schistocerca obscura) in the picture, grows up to three inches in length. Brown wings against a green body help it stand out when startled and flying. 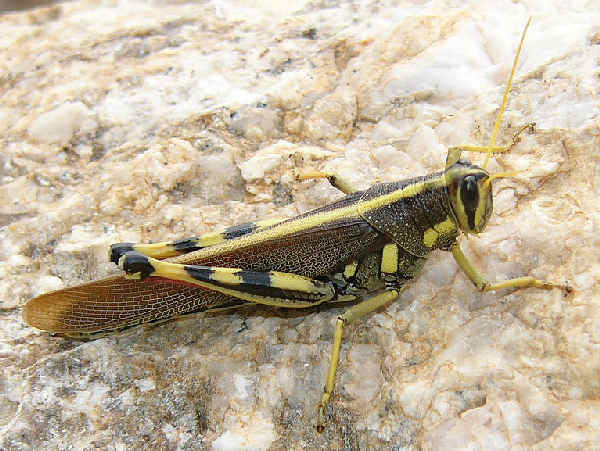 The light yellow dorsal stripe on the next grasshopper suggests a White-lined Bird Grasshopper (Schistocerca albolineata), a native desert Southwest species. A variety of Orthoptera species go by the name cricket, however, members of the Family Gryllidae, also known as field crickets, bush crickets, ground crickets and tree crickets, are perhaps the best known. 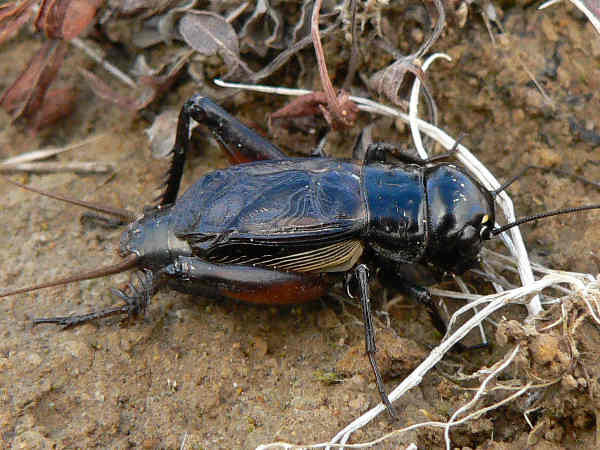 Most cricket species are best known for their singing ability. In fact, only the males have the special forewings necessary to produce the typical cricket chirp. Speaking of wings, while crickets have them, they are more a jumping than flying insect. Many entomologists estimate that common house and field crickets can jump up to twenty times their length. A five foot human would have to leap one hundred feet to match that record. Asian cultures such as China and Japan share a long history of being enamored with crickets. People traditionally kept them as pets in cages or boxes to enjoy their singing or fighting abilities. Identifying Katydids and differentiating them from grasshoppers can be a relatively straight forward task. Green bodies and long antenna serve as the dominant katydid (family Tettigoniidae) characteristics, although some katydids change body color to blend in with their background. Their long antennas explains their nickname, long-horned grasshoppers. The first two pictures show variations of one of the most common katydids found from coast to coast. The fork-tailed bush katydid, Scudderia furcata. The first picture shows a maturing specimen, still with black legs. The second picture shows a fully developed adult. Adding some spice to the katydid picture, there are even some pink forms of the species. Of course, every time a rule of thumb for insect identification gets written up, the exception to the rule follows. The next picture shows a Brown-spotted Bush Cricket, another insect that belongs to the katydid family. It’s a European native species that inadvertently got imported to the United States and now thrives in meadows and grasslands along the Pacific Coast. 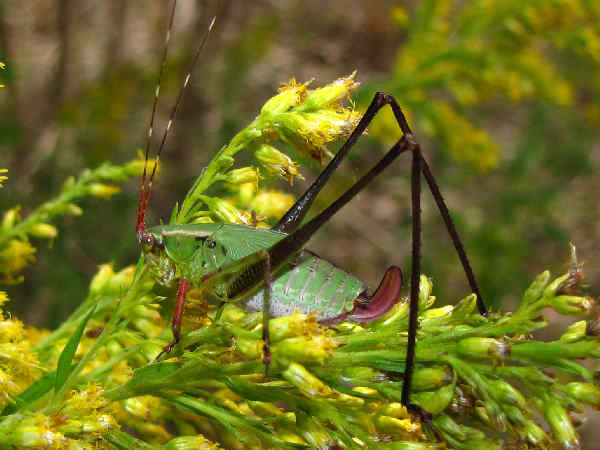 Short-wing Katydids are a Southwest regional genera (Dichopetala). Their above average size and sedentary nature makes spotting them on the foilage around the yard fairly easy. 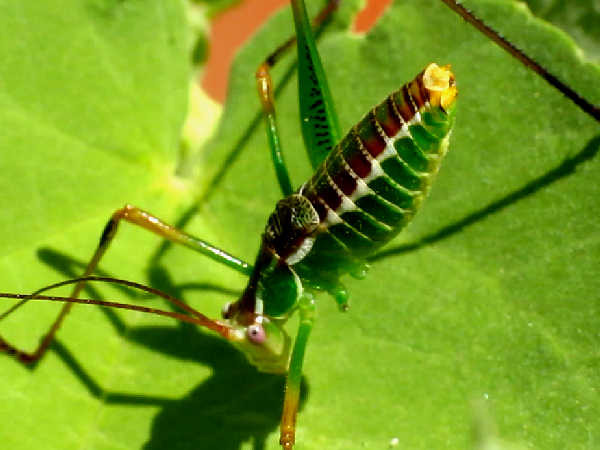 The loudest insect song in North America is produced by a coneheaded katydid. Under favorable conditions its song can be heard from as far as 500 meters. Most of the worlds katydid species inhabit tropical and subtropical regions. A by the numbers look at Katydids brings up approximately 250 species divided into fifty genera. 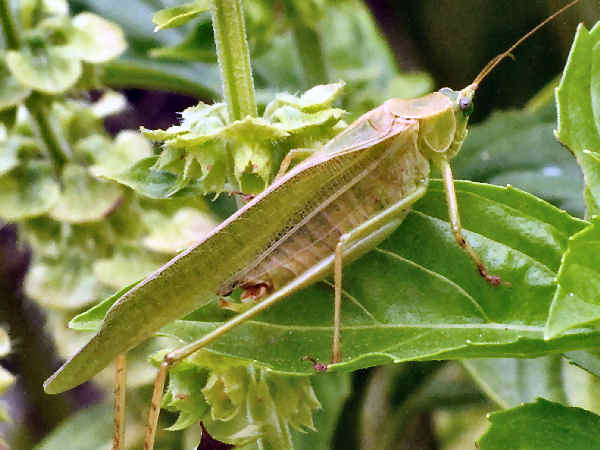 Compared to the historical accounts of damage caused by the world’s grasshopper populations, katydid damage to agriculture interests might seem low. Nonetheless, katydid damage to field crops, citrus trees and residential trees can be substantial in instances of population outbreaks.